Flexible MDF is a grooved medium density fibreboard that is machined with the sole intention of creating a malleable panel. The product is suitable for general purpose (non-structural), interior applications where bending or deflection is required. Long grain and short grain profiles are available on request depending on the intended flexibility required. 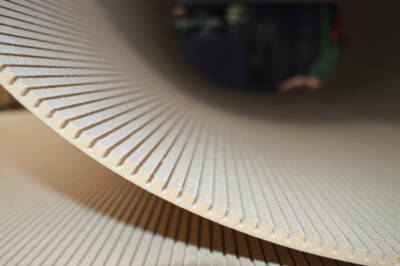 Flexible MDF is available with FSC® certification on request. The company’s robust Chain of Custody management system ensures that these certifications are respected and adhered to throughout the supply chain. For further information, please refer to our Environment Page.